Ovah Coffee: The Mango Body Butter Yum! 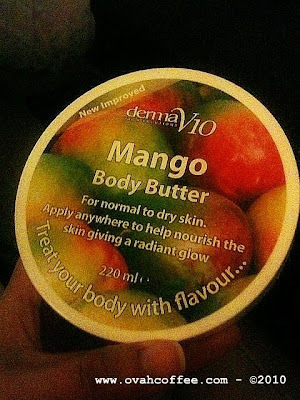 The Mango Body Butter Yum! This creamy mango body butter, aside from its very sweet fabulous delicious smell is very moisturizing [will last for long hours] without the greasy after feel. My skin loves it. In fact, my skin's addicted to it! I've told my boyfriend that I'll be sticking to this body butter for as long as it's on the market. His reply? ~~~ "Good!" It feels good to know that my skin smells heavenly! Nighty nighty everyone! Hugs to you all! I love body butters and mango is one of my favorites. I like the one made by The Body Shop. I haven't seen this one that you recommend. I've never tried the mango body butter before and I am really happy that I've tried it. It's my favorite, too! I haven't tried the one from The Body Shop. The brand that I am using is from the UK. Not sure if the brand's reached the US.